Tuning in the Caps/Lightning contest last night was like watching a game from last season. The Capitals’ top line dominated, the team was ready offensively, goaltending was solid, and it felt like it was 2010 all over again. 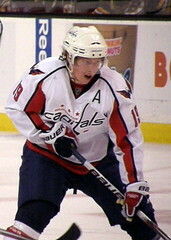 The Caps dropped Southeast Division rival Tampa Bay by a 5-2 score, putting 5 goals behind Lightning goalie Dwayne Roloson, who has previously stoned the Caps – twice. Nicklas Backstrom potted two goals and four points, captain Alex Ovechkin contributed a power play goal (his first since Oct 30) and three assists, and linemate Jason Chimera finished it off with an empty netter. The result was a happy one for Caps fans, who let out a collective sigh of relief across the DC area. Whether the team that showed up last night in Tampa is the one returning home this weekend remains to be seen, however. The Caps face a battered Penguins team on Sunday during a Super Bowl appetizer match-up; game time is 12:30 on NBC. The Caps’ penalty kill streak was ended at 27 when Brett Clark tipped a puck in behind Semyon Varlamov with only 7 seconds left in a Matt Hendricks penalty. But it was the last score the Lightning would get on the night. The Caps are now only three points behind Tampa in the division.